The anterior segment of the eye comprises the anterior chamber, the cornea, and the iris. 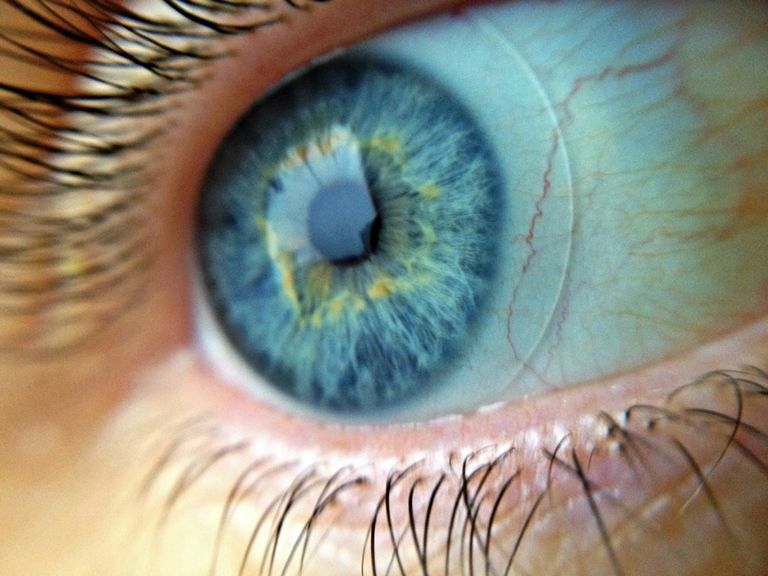 More than half of the HIV-infected population are likely to develop a complication of the anterior segment ranging in severity from dry eyes to viral infections that can potentially cause blindness. Iridocyclitis is the inflammation of the iris, which can be associated with a number of opportunistic infections (OIs), including cytomegalovirus (CMV), herpes simplex virus (HSV), toxoplasmosis, tuberculosis, and varicella zoster virus (VZV). The severity of the inflammation is closely associated with the severity of the OI and can often be the first sign of an advancing disease. The most serious cases tend to involve patients with very low CD4 counts. Iridocyclitis can also manifest as a result of syphilis, as well as drugs like rifabutin (regularly used in tuberculosis therapy) and cidofovir (used to treat severe cases of CMV). Iridocyclitis can present in one or both eyes, with symptoms that can include red eyes, excessive tearing, light sensitivity (photophobia) and constricted pupils. Iridocyclitis tends to improve with successful antiretroviral therapy along with treating the identified infection. Keratitis is an infection of the cornea that can be caused by HSV, VSV, candidiasis (a fungal infection seen frequently in people with HIV), and other possible infections. In many cases, immunosuppression predisposes the patient to keratitis, the symptoms of which can include red eyes, excessive tearing, eye pain, blurred vision, light sensitivity (photophobia) and the feeling of grittiness in the eye. Presentation can either be bilateral (involving both eyes) and unilateral (involving one eye). Potential complications can range from corneal ulcers and scarring to partial loss of vision and even blindness. As with iridocyclitis, the initiation of antiretroviral therapy is recommended to lower the risk of complications, as well as treatment of the identified infection (usually with acyclovir for HSV and VZV, or the appropriate antifungal in cases of candidiasis). Microsporidiosis is an opportunistic fungal infection, which generally occurs when a patient's CD4 count drops below 100 cells, mL. While corneal infections are rare in cases of microsporidiosis, they can present with eye pain, excessive tearing, blurred vision and light sensitivity (photophobia). In addition to implementing antiretroviral therapy, microsporidiosis is often treated with azole drugs such as albendazole and itraconazole. Topical antifungal drops are also sometimes used with azole therapy. Cunningham, E. and Margolis, T. "Ocular Manifestations of the Eye." New England Journal of Medicine. July 23, 1998; 339:236-244. Parrish, C.; O'Day, D.; and Hoyle, T. "Spontaneous Fungal Corneal Ulcer as an Ocular Manifestation of AIDS." American Journal of Ophthalmology. September 15, 1987; 104(3):302-303. Rocha Lima, B. "Ophthalmic Manifestations in HIV Infection." Digital Journal of Ophthalmology. October 29, 2004; 10(3): online version. Sudhakar, P.; Kedar, S.; and Berger, J. "The Neuro-Ophthalmology of HIV/AIDS Review of Neurobehavioral HIV Medicine." Neurobehavioral HIV Medicine. September 17, 2012; 2012(4):99-111.